These parents are asking a great question that shows that they are tuned in to their son’s anxiety and are looking for ways to keep anxiety at bay as much as possible. REDUCING ANXIETY for the child and parent is the first STEP in our responsive process. This family is very early in making the transition to a responsive feeding approach. There are many things they are likely working on and they don’t have to do it all at once! Honor the parent’s instinct to work on other things first. They might work on having more regular meal and snack times, (STEP two is routine) and avoiding any pressure, both more “negative” (multiple prompts to eat, comparing to sibling, taking away game time etc.) and “positive” (praise, stickers, rewards for eating). 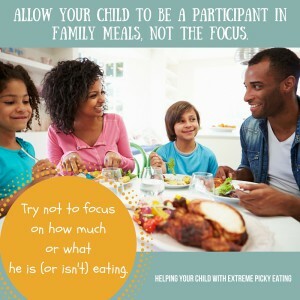 They may also be working on getting their son used to having unfamiliar or more challenging foods at the table, and working towards conversations and connection over focusing on intake. Seeing progress in these areas, allowing the child to gain confidence and comfort from routine, non-pressured meals will set the stage to address the distractions that he may have relied on as a coping tool. Why are distractions so common with feeding challenges? Distractions do just that, distract children from eating and mealtimes. However, tuning in at mealtimes, to each other, and to their own cues of hunger and fullness, is critical to the process of learning to be the best eater they can be. This may take care of itself with time. Often, as routine, pressure-free and pleasant meals are happening regularly, the need to cope or zone out fades away and the crutch is less needed. As needed and in age appropriate ways, work on teaching other coping skills (away from mealtimes). Books (apps for teens) for addressing anxiety in children, teaching belly-breathing for example, can help. Psychologists might work on biofeedback, play therapy and other embodied therapies. Ask the child to choose one meal or snack where the distraction is left for after the meal. Schedule time with the distraction (screens, toys etc.) just before or after a meal. Have the distraction available for the first or last five minutes of a mealtime. Have the child choose one or two stuffed animals to join him at the table. 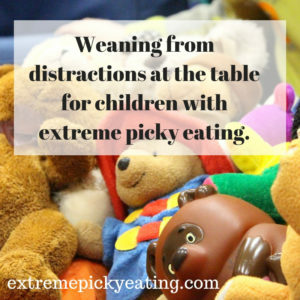 Allow the stuffed animals to sit on their own chair at the table as if they are part of the family meal as well. Find ways, in other words, to gradually lessen the time, or the amount that the animals play. Perhaps he could even feed them before the meal and then they can have a nap during mealtimes? There is no one right way or protocol to do this. With a responsive approach, parents gauge how to best facilitate their child’s progress. During times of stress or illness, he may revert back to needing the comfort or distraction of his stuffies. Keeping the long-term goals in mind, and working on making the environment around mealtimes the best it can be is likely to help the most. Good luck to this family!